Sitting in the firm’s recently opened New Fetter Lane office, Matthew Field talks to Bird & Bird international head of intellectual property Morag Macdonald (pictured) as the firm targets London expansion. Legal Business catches up with Skadden, Arps, Slate, Meagher & Flom disputes veteran Rory McAlpine (pictured) to discuss the Hong Kong legal market and the cases he has advised on throughout his career. Following his appointment as Freshfields Bruckhaus Deringer‘s first regional managing partner for the ‘rest of continental Europe’ – for offices excluding Germany, Austria and central and eastern Europe – Paris-based corporate partner Alan Mason (pictured) speaks with Madeleine Farman about his plans to shape the role. Set to take on the top legal role at Santander UK later this year, The Royal Bank of Scotland’s outgoing general counsel (GC) John Collins (pictured) talks to Sarah Downey about his career and the growing recognition of in-house lawyers. Chicago litigation firm Jenner & Block’s launch of its first overseas office earlier this year in London was as soft as they come. 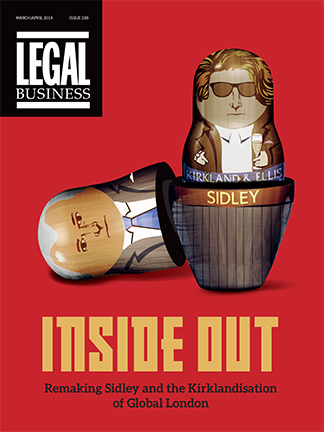 Is there space for another litigation firm or will London be its graveyard? Charlie Lightfoot (pictured), the man tasked with growing the firm’s London office, talks of the firm’s prospects. Having attended Legal Business’s first International Arbitration Summit in September to debate issues on investor-state disputes, Sir Frank Berman KCMG QC (pictured) of Essex Court Chambers talks to Sarah Downey about the highlights of his 50-year career, London’s status as a disputes hub, and the future of the Bar. Quinn Emanuel Urquhart & Sullivan was the talk of the town when it took on some of the world’s largest banks in post-crisis related litigation. The concept paid off for a firm which this year posted revenues just over $1bn with profits per equity partner reaching just under $5m – the second highest recorded in the Global 100. However, as crisis-related disputes reach their tail-end, founder and managing partner John Quinn (pictured) speaks to Legal Business about the firm’s current growth plans.